Going Postal: Cap Man Fever, Part 2 OR Whither, Cap Man? Cap Man #12, Forbes Ave.
Cap Man has left the building. More accurately, he’s likely left Pittsburgh entirely*. 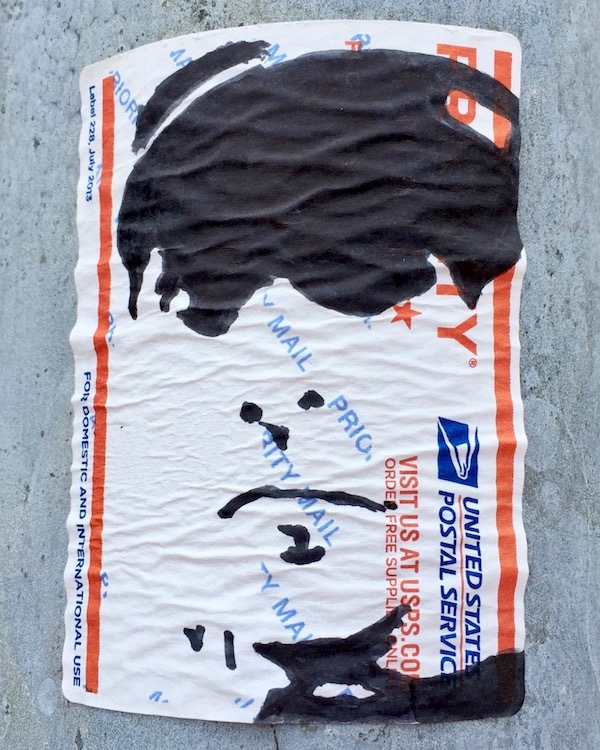 The possibility also exists that the young “postal slap” artist who decorated the lamp posts and traffic signage of central Oakland over the past year has just moved on to another less public hobby. But we doubt it. Cap Man #10, Neville St.
Let’s back up. 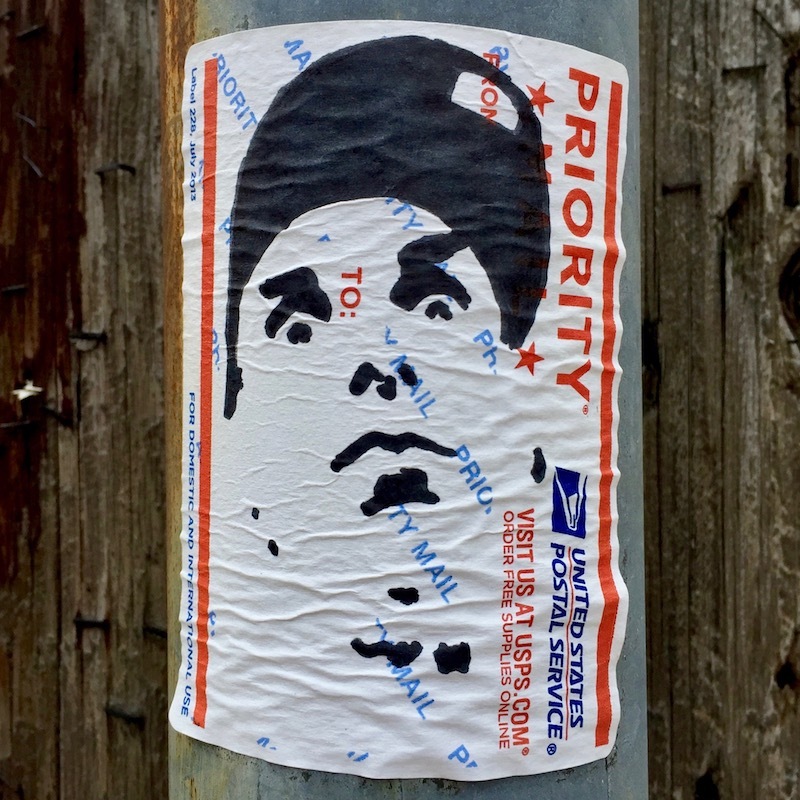 Over the summer, we reported on the serial application of hand-created Sharpie-on-postal label artworks throughout the greater Craig Street and Forbes Ave. area of Oakland. A lot of folks use this medium, but few work in portraiture. [See “Going Postal: Cap Man Fever”, Pittsburgh Orbit, June 11, 2017.] 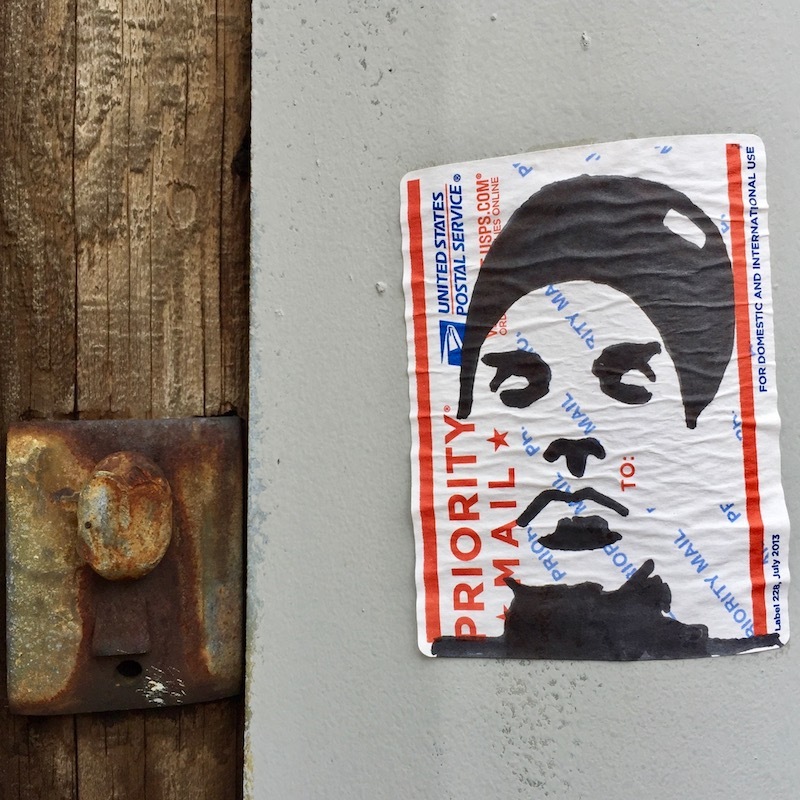 These little sticker pieces were committed by an unknown, anonymous artist who appeared to be (perhaps overly) obsessed with literally plastering his face all over town. 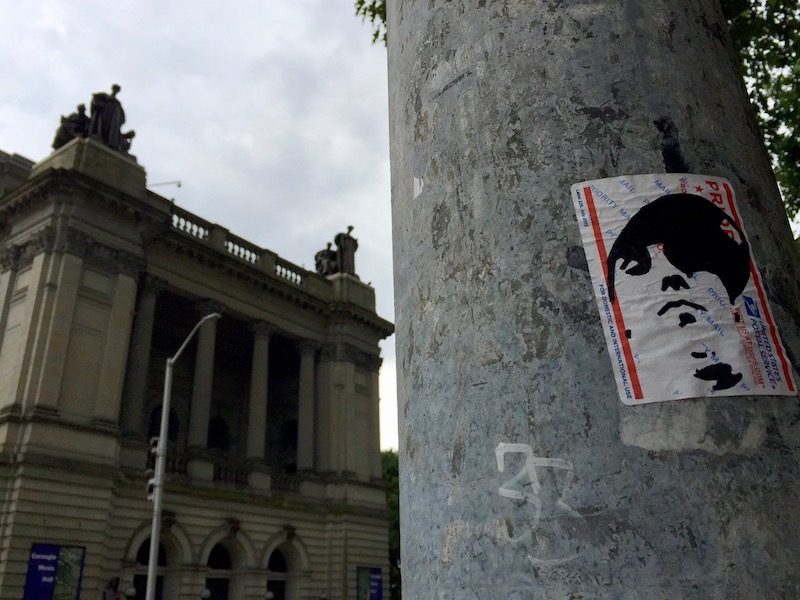 No sooner had we published our second, tangentially-related story [“Going Postal: Rogues Gallery”, Pittsburgh Orbit, July 30, 2017] than a new salvo of Cap Man (self-)portraits began appearing, including a nice run down mostly-residential Neville Street in Oakland. Cap Man #9, Neville St. The image was unmistakably our guy–the same upturned, tagged, and jauntily off-center ball cap; the same flat expression and deep-seated eyes on a familiar young white guy face–so we bagged them. 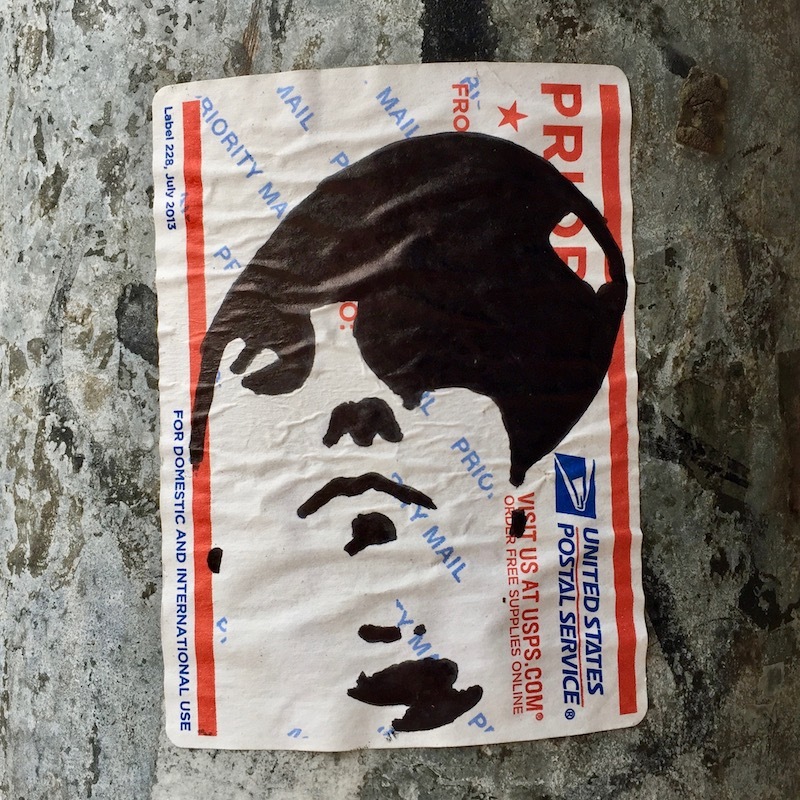 [Observant Orbit readers will note our photographs are from a point after some heavy mid-summer rains soaked the stickers thoroughly, leaving the dried artifacts crinkled, but still color-rich.] Then we waited for more…and waited…and waited. But, as we learned from the years counting the seconds for Chinese Democracy to drop, there’s a point where it’s healthiest to just let go. This then may be a final goodbye as well as a thankful tribute to Cap Man. For whatever brief period, he made the sidewalks of Oakland a little more interesting and the art of the postal slap a little more creative. So what’s become of Cap Man? Our original hypothesis–a Pitt student who slapped his way across Oakland in the daily commute from a bus stop on Fifth and/or Craig Street to his campus classrooms–still holds water. Perhaps even more so, considering the termination of the ink portraits roughly coincides with the end of the university’s summer term. That said, it’s safe to say there’s a fair chance we’ll just never know what was up with this dude. Cap Man may well have taken his business or computer science degree back to Philadelphia, New York, or Washington, D.C. and is now safely installed running the numbers or pushing digits far from the telephone poles of central Oakland and the bus shelters of Bloomfield. Hopefully he’s still got his collection of Sharpies and they’re not just used for addressing large packages and system diagraming on large conference room brainstorming tablets. Wherever you are and whatever you’re up to, godspeed, Cap Man. * A little gender assumption here, yes, but as explained in the earlier post, Pittsburgh Orbit believes these are self-portraits of a young man.